The purpose of the Nijkerk-Schenectady Foundation is to preserve and promote the contacts between Nijkerk and Schenectady. This is done through the exchange of groups of youngsters and adults from both cities. Exchange of specific groups, such as musicians, athletes, teachers, employees of institutions and companies, etc. is also a possibility, and there is a possibility to exchange during the holiday your home with the home of someone in Schenectady. The Foundation is trying to convey consciousness and understanding of each others culture and way of life, work and way of thinking. How did the contact started. After the founding of the city of Schenectady by Arendt van Curler and Kiliaen van Rensselaer it was until 1909 before there was contact between the two cities. In that year the Hudson-Fulton celebration in New York took place. Both the discovery of the Hudson River was remembered as well as the taking into service in 1807 of the first steamship on the river by Robert Fulton. In July 1909,an American company, headed by Dr. W.E.Griffis came to Nijkerk to unveil a brass plaque in the “Grote Kerk” in Amsterdam. 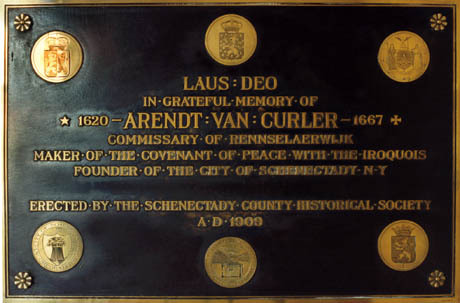 This was in honour of Arendt van Curler, “Commissary of Rensselaer Wijck, maker of the peace agreement with the Iroquoi, and founder of the city of Schenectady”. Koperen gedenkplaat (1909) in de Grote Kerk te Nijkerk. Although there was some correspondence between the two cities and there have been an occasional visit, the contact really started again in 1984. On invitation of the city of Schenectady a group of 31 Nijkerkers visited that city and stayed for a week. This happened due to the trans-Atlantic solo cruise of Goos Terschegget, Deputy Mayor of Nijkerk, with his ship “De Volharding”. This caused the municipality of Nijkerk to start a study group to maintain and extent the contacts between the two cities. From that moment there was a regular exchange of groups of adults and youngsters. 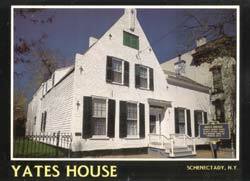 In Schenectady as well as in Nijkerk the participants were accommodated with host families. Always an extensive social and cultural program was offered, incidentally the business aspect was not forgotten and there were also visits to the various companies. 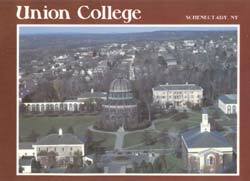 This was the reason for Nijkerk to found the Nijkerk-Schenectady Foundation in 1990. In 1992, in America the Schenectady-Nijkerk Council, our sister organisation, was founded. The visit of the Jazz Band of the Schenectady County Community College was the first cultural exchange between the two cities. During the visit to Nijkerk in 1992 the basis for further exchanges was laid, in the first place this was meant for the youngsters. 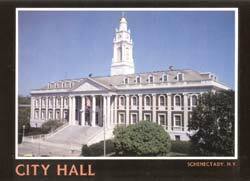 A highlight was that all Nijkerkers became honorary citizens of the city of Schenectady. In the summer of 1993 seven young Americans stayed in Nijkerk for tree weeks. They visited various companies and several important cultural attractions. They stayed in the homes of Dutch families and in this way they were given more insight into the Dutch lifestyle. 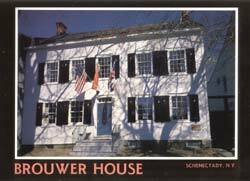 In 1998 the Mayor of Nijkerk, his wife and the chairman of the Foundation attended the festivities of the 200-year history of Schenectady. In the Schenectady Museum, the Foundation organised an exhibition of paintings of old Nijkerk farms. After this it was made possibly that there were exchanges for other groups, such as athletes, musicians, teachers, employees of institutions and companies, etc. The first aim of the Foundation is the exchange of youth of Nijkerk and her sister city Schenectady on an regular basis. It is noteworthy that a cross-section of the population of Nijkerk is excited with this contact and participate in these exchanges. Also concerning the youth, we try to have a good cross-section of the school going and working youth. Photo’s of several remarkable houses and buildings in Schenectady.